rayl,[p]Yes, you should have a rack between the bird and pan. There are racks available that are only about 1/2 inch high. Safeway (Von's) has one that folds flat. My GF just got one the other day. [p]Since it's so close the the big day, I'd see if you ca find one in the gadget section of your local grocery. 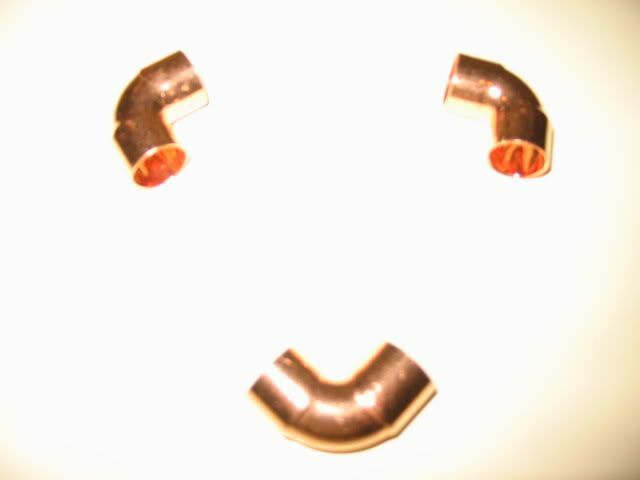 Not sure just who to thank for this but three 1/2" copper elbows at $.18 each make handy dandy spacers. If using the method shown in the Mad Max Directions, the inverted place setter with the green feet and placed on that the roasting pan w/ the bird in a V-Rack should be okay...right? I guess you can put an inverted pie pan or the copper fittings under the roasting pan but it is the same thing as using the green feet it sounds like. Confirm? The green feet work great as a spacer.